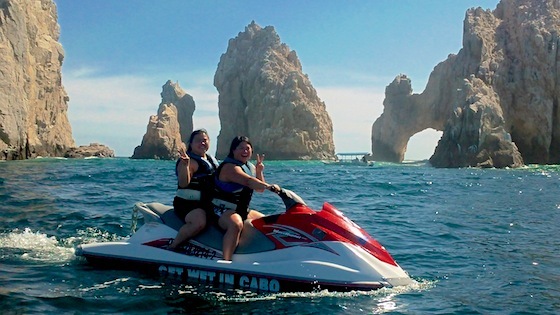 One of the things Maddie had been interested in for our Cabo trip was to rent Waverunners, and to ride out to El Arco, the famous rock formation at the southernmost point of Cabo San Lucas, and of Baja California. 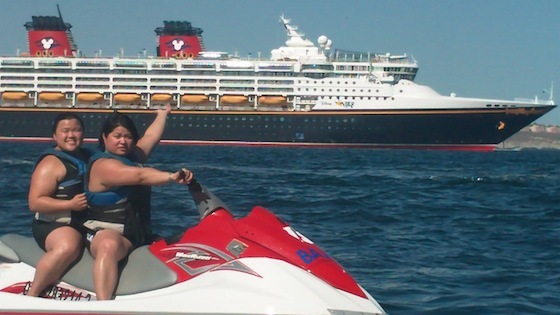 This sounded both exciting and scary – when I’m in the ocean, if I’m in a “personal water craft” I prefer it to be man-powered – I just don’t trust myself or others that much with high-powered personal motor vehicles! Anyway, I also know I don’t want to let my irrational fears get in the way of me experiencing cool stuff in life. And in the grand scheme of things, I knew that “wave running” wasn’t going to be too risky. After all, they provide us with lifejackets, and we could always steer away from any questionably-riding speed demons out on the water. Yikes! We signed up. When we got to the beach, it was just starting to get crowded. We parked at the Mango Deck Restaurant/Bar and stopped for a bite to eat and something to drink. It was here that we realized that it really is kind of crazy on this beach with all the drinking and the potential for bad decisions! EVERYBODY was drinking … a lot! 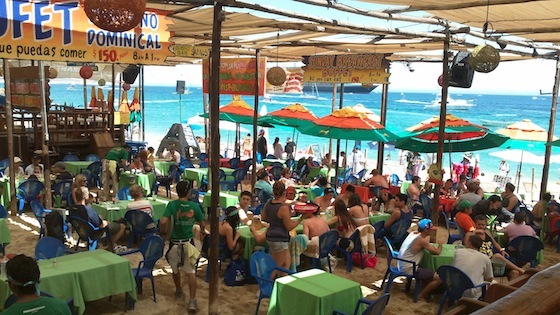 There were even restaurant-sponsored drinking games being played on the beach! Geez! And it wasn’t even really Spring Break yet – we all wondered how crazy it must be when it IS that time down here. After our snack, and after waiting for the sun to pass the broiling point, we ventured out onto the beach. The view was just gorgeous. 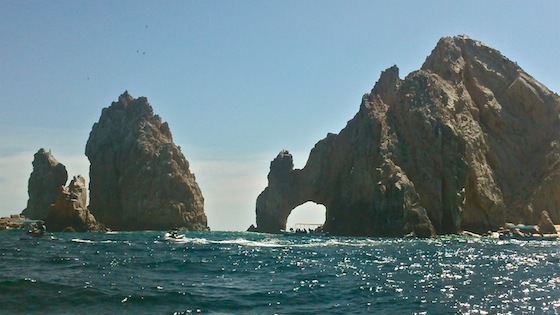 This spot is known as “Land’s End” – El Arco is all the way at the left, the second to last bump in the formation. 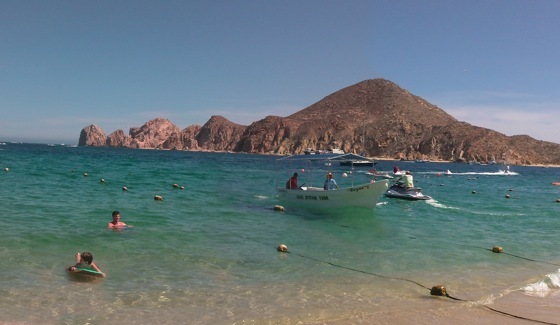 Wouldn’t you like to take a lovely Disney Cruise to Cabo San Lucas (and ride Waveriders, too)?! 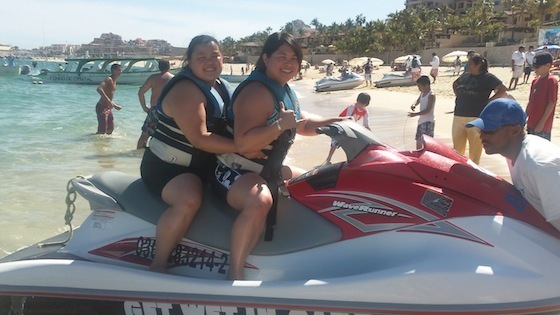 After a while, Kim and Joanna wanted to hang out on the beach, so we all went in and Maddie got to have some time on their wave runner by herself. Joanna suggested I take the camera, but I thought we probably had all the shot’s we’d need. Big mistake! 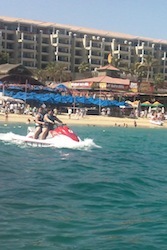 When Maddie got on her Waverunner, she took OFF! She was a total daredevil speed demon and it was awesome! When I was driving her around I think my top speed might have been 20mph. All I could think about was tipping the darn thing over and having to pay thousands of dollars in damages. Maddie was flying through the water and leaving waves and whitewater behind. It was super cool. I just wish I had gotten video of it. Watching her speed around having fun helped me to relax and mess around on my Waverider a bit more, too. That was cool. After being out for about half an hour more, we headed back in to shore. What a fun time. 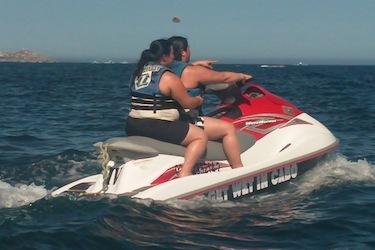 I was especially glad we didn’t die, or have to pay anyone for a lost or damaged Waverunner. Ha! I think after you get to be on one for a while and get the feel for it, it’s actually much more comfortable. I’d probably go out on one again. Thanks for getting us all out there to do it, Maddie! It was great!